National pride swelled upon the arrival of HMAS Australia in 1913 — and her scuttling just over a decade later stirred outpourings of emotion. Nicole Cama tells the story of Australia and its role in the country’s nationhood, 100 years after the flagship first arrived. 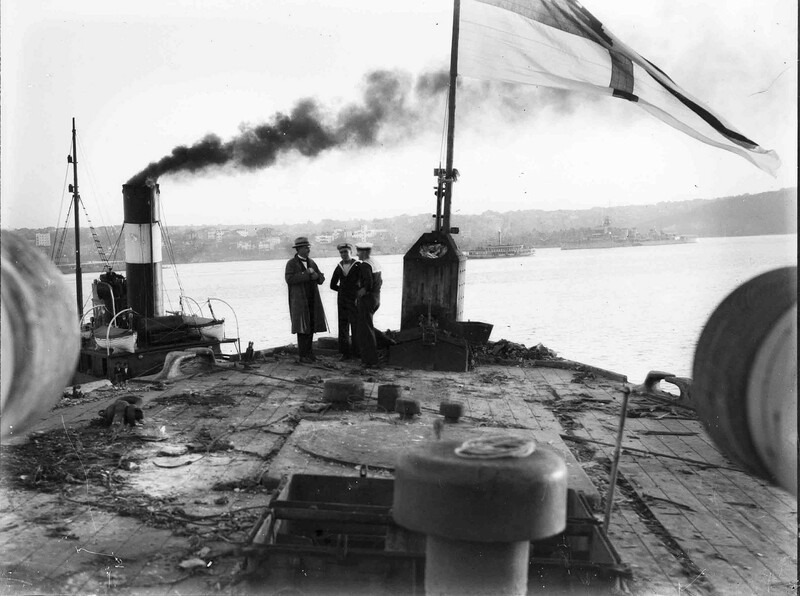 HMAS Australia being towed to her doom in 1924. 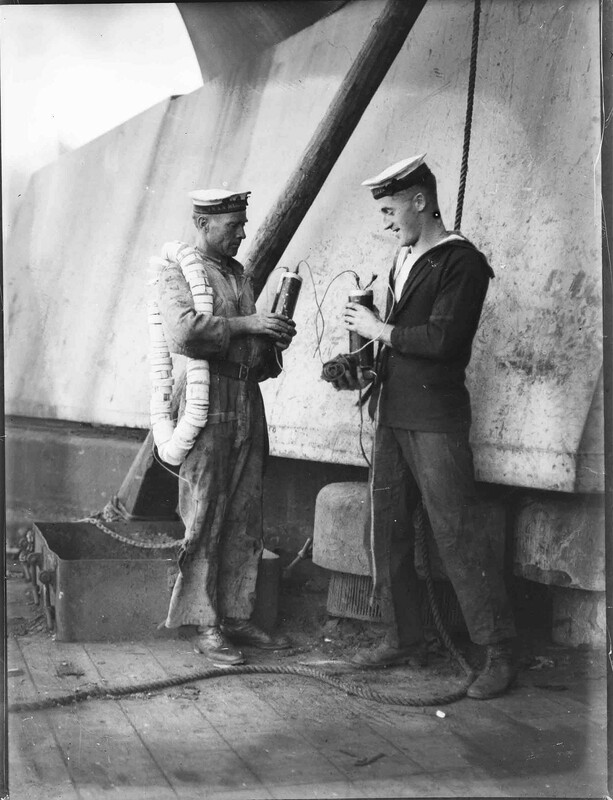 All images courtesy of Samuel J Hood studio collection, Australian National Maritime Museum. AUSTRALIA’S first naval flagship, the aptly named battlecruiser HMAS Australia, arrived in Sydney Harbour on 4 October 1913. Her arrival from England caused as much fanfare as a royal visit, and thousands of spectators watched spellbound as the Royal Australian Navy’s (RAN) new fleet entered the harbour. Little more than a decade later, Australia would be controversially stripped, dismantled and scuttled off Sydney Heads. As I researched the Samuel J Hood photographs in the Australian National Maritime Museum’s collection recording the event, it was the extraordinary public outpouring of grief that captured my attention. Contemporary descriptions of the event are strikingly emotive. They demonstrate how Australia was personified through her “beauty and mystery” as she morphed into a national symbol, which has only made her demise all the more dramatic and historically significant. Three months before their arrival in Sydney the ‘Botany Bay Buccaneers’ (as the Portsmouth dockyard workers christened the crew of the flagship) saluted as they swung out of port and set course for Australia. According to English journalist Frederic Morley Cutlack, there were no fanfares except for a band playing the sea shanty Rolling Home. For the crew, this meant little, as reportedly just over half of them were British. Nonetheless, as Australia glided through Portsmouth Harbour, a crowd of labourers and “moist-eyed women fluttering their little ineffectual handkerchiefs” farewelled the battlecruiser as she commenced her maiden voyage. On the deck of the Australia that marvel of it, the unsubstantial texture of the dream fabric of which it once was woven, takes shape in the sober colours of reality. It is no longer dream, but living truth. On the deck of the Australia the new Australian… ideal of national defence looms into solid significance. The ship is there, the men are there — English and Australians, half and half — the white ensign and the Australian flag are there. Signs and symbols these, of great things. The Australian Fleet is not merely the embodiment of force. It is the expression of Australia’s resolve to pursue, in freedom, its national ideals, and to hand down unimpaired and unsullied the heritage it has received, and which it holds and cherishes as an inviolable trust. It is in this spirit that Australia welcomes its Fleet, not as an instrument of war, but as the harbinger of peace. 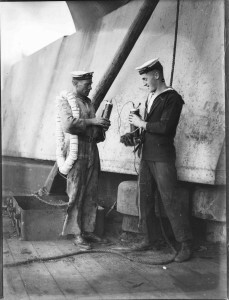 RAN sailors hold demolition charges on the deck of Australia, 12 April 1924. Within 10 months of this statement Australia, as a sovereign state of the British Empire, entered into its deadliest conflict to date, the so-called “war to end all wars”. Although for the nation’s flagship, as it turned out, there was not so much glory as some may have wished. Australia missed the Battle of Jutland in 1916 due to an accidental collision with HMS New Zealand, and spent the rest of the war undertaking patrols and training exercises during North sea Operations. Rather than participating in battle, Australia acted more as a deterrent. in a letter to his wife dated 18 August 1914, the commander of the German East Asia squadron, Vice-Admiral Maximilian Reichsgraf von Spee, wrote that ‘The Anglo-Australian Squadron has as its flagship the Australia, which by itself is an adversary so much stronger than our squadron that one would be bound to avoid it’. Despite intense protestations, many within the RAN saw reason in this proposal, including Commodore J S Dumaresq, who noted in 1920 that Australia had deteriorated so badly she was essentially “crippled”. In January 1924, Australia was sold by the government for a mere £3,000 to Messrs G C Wright and Kent Hughes who were acting on behalf of a group of Melbourne investors known as the ‘Sorrento Syndicate’. The ship was interned at Garden Island to be dismantled. HMAS Australia being stripped at Garden Island. It was a cool and sunny morning on 12 April 1924, when the last preparations were made before Australia began the ‘journey to her doom’. The day before, naval ratings had shown up in droves to say goodbye, with one declaring, “I simply had to have a look at my old ship.” All that remained was the hull, stripped bare of all her guns, and the original Australian flag and White Ensign first hoisted 11 years before. 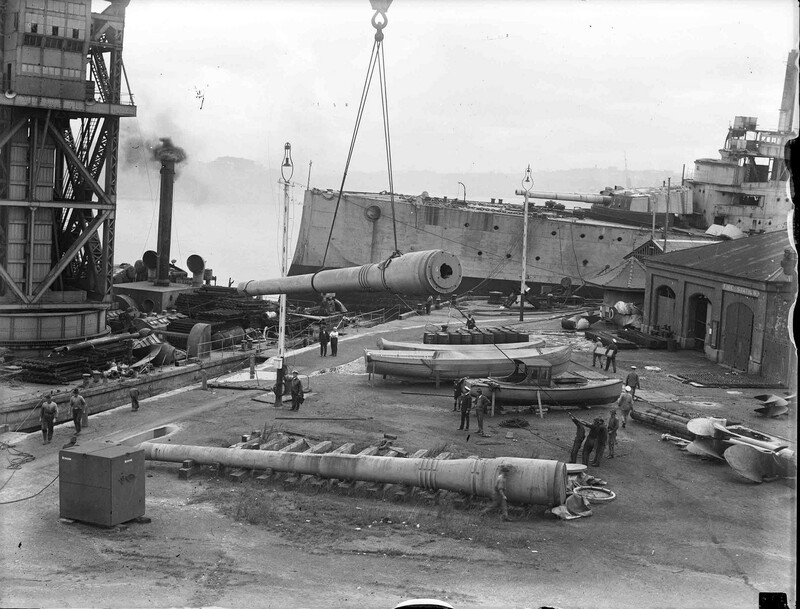 Wreaths were placed on the jetty at the Man-O-War steps before being taken to Garden Island. More than 200 tokens were received with a few containing cards from the mourners, one from a ‘Digger’, others from ‘A Loyal Australian’ and ‘Two Little Aussies’. Maimed and mutilated, Australia took more than six hours to reach her burial place, about 37km off Sydney Heads. 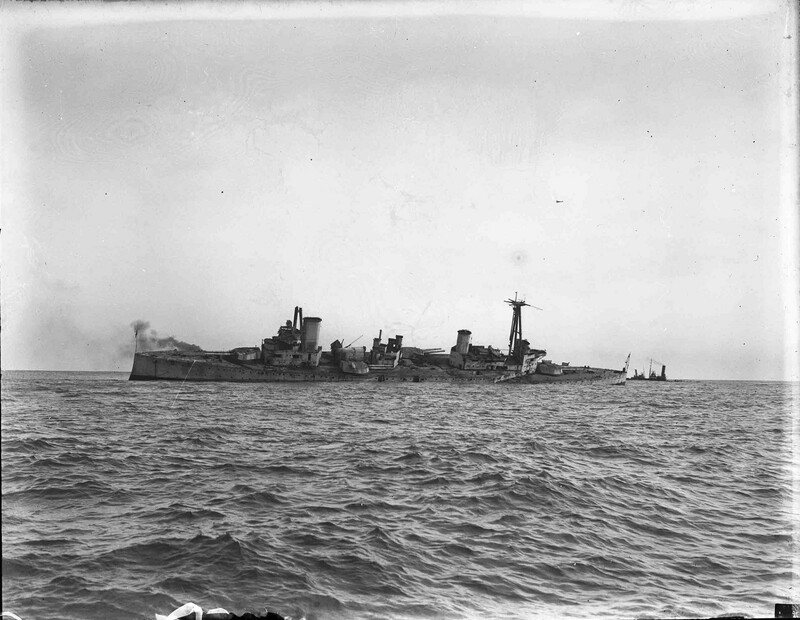 Present at the funeral procession were His Majesty’s Australian Ships Brisbane, Melbourne, Adelaide, Anzac and Stalwart and the ships of the visiting British Light Cruiser Squadron, HMS Delhi, Danae, Dauntless and Dragon. Of the 15 crew members who were specially chosen to stay on Australia as the ‘sinking party’, three officers remained on board until the demolition charges were set off and the seacocks were opened. The last message to be sent from the old flagship before she went under was from Captain A G Craufurd, RN, Engineer Commander P E McNeil, RAN, and Commander R C Garsia, RAN of HMAS Marguerite. At 2:31pm, the message “Everything is open” was sent, and the remaining officers hastily departed the vessel. What can we give in return For her beauty and mystery…? Flings out Trafalgar’s deathless sign. — Excerpt from Australia by Dowell O’Reilly, 1913, published the day Australia arrived in Sydney. For a few moments, nothing much happened, and then a long rumble sounded across the sea as the water rushed into the hull and Australia listed to port. A roaring sound was heard and, like a “monster of the deep”, she turned over completely and finally slipped beneath the surface. 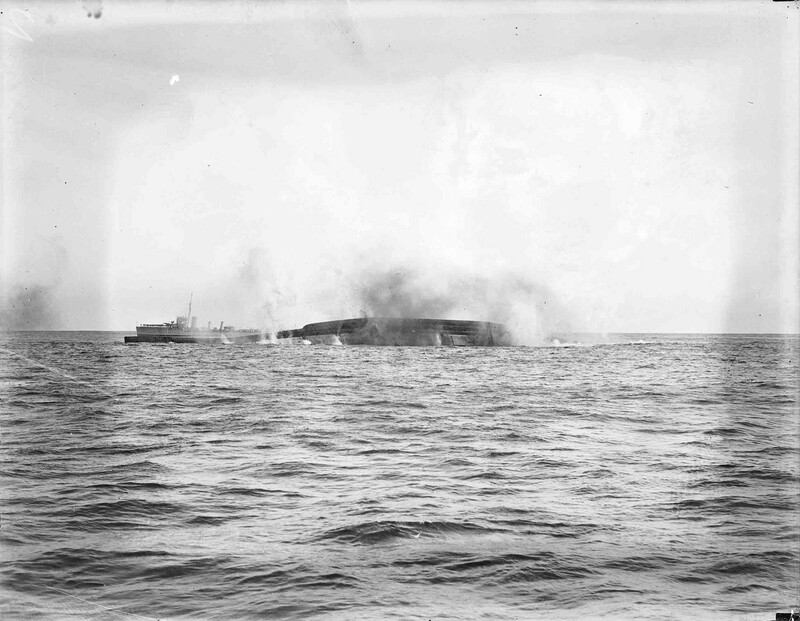 As she sank to her watery grave, Captain H Feakes of HMAS Brisbane described what he witnessed: “strong men were wet-eyed. Many cursed. It was a tragic blunder.” Although cheers sounded from the passenger steamers, the naval officers and ratings stood to attention in silent salute to their ‘old and trusty friend’. As the gun salute of the naval vessels fired, the steamers added their voices and tooted their horns. A wreath of cream and pink dahlias from ‘Three Australian School Children’ was dropped from an aeroplane over the spot where Australia disappeared from view. 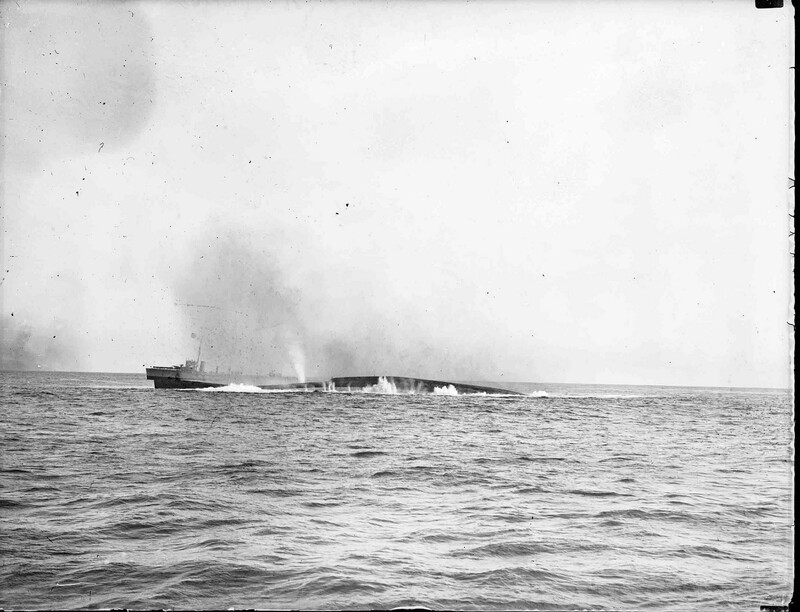 Within 21 minutes, the ‘pride of Australia’ had sunk and all those who stood to witness were left with a ‘sad void’. Perhaps, in a way, a leftover of the past had to be laid to rest. Just as the Washington Naval Treaty endeavoured to put the horrors of World War I in the past, the sinking of Australia was the deliberate closing of a chapter. The sheer scale of loss was something the country had never experienced, and it destroyed the romanticised notions held by so many. The Australia symbolised the pre-war years of optimism and power, and its sinking could not have been more symbolic of the inevitable political, social and economic changes that occurred during the 1920s. … imported a national, almost personal, sense of loss as of the passing of a well-loved heroic soul. The Australia was well named – she did in very truth … represent this Australian people … she helped us largely to our nationhood. If that nationhood was born at Anzac, it was christened when the ship that bore its name patrolled the waters of the world and bore so well the heat and burden of the war. It is certain that there will grow up round her there a tradition more poetic and inspiring and lasting than could possibly have grown round her, a dismantled and decaying hulk in harbour. We of her generation will hold her a living memory; the child of the future will soon fashion her into a phantom ship that keeps watch and ward along our shores. Let us then send her out bravely decked with flowers and wreaths to mark the hope and pride that mingle our regrets. Maybe I am just that ‘child of the future’, who has attempted to describe how the steel contours of a battlecruiser bewitched a nation and how the death of Australia’s first naval flagship touched a people. NOTE: This article was first published in Inside History magazine, Issue 17, (Jul–Aug 2013), pp 60–63 and on their blog. Reproduced courtesy of Inside History magazine.